US President says he received "great letter" from North Korean leader and looks forward to meeting him again. US President Donald Trump said on Wednesday he had received a "great letter" from North Korean leader Kim Jong Un. "I just got a great letter from Kim Jong Un," Trump told a cabinet meeting, according to AFP. He reiterated that he still expected to hold a second summit with the North Korean leader, after the two signed a pledge on denuclearization of the Korean peninsula during their first summit in Singapore last June. Earlier this week, Kim said in his New Year’s address that he is willing to meet Trump “at any time”, but also warned he would seek a “new path” if the United States continues to demand unilateral action from North Korea. The North Korean leader added there would be faster progress on denuclearization if the United States takes corresponding action, though he stressed that his resolve for complete denuclearization remains unchanged. 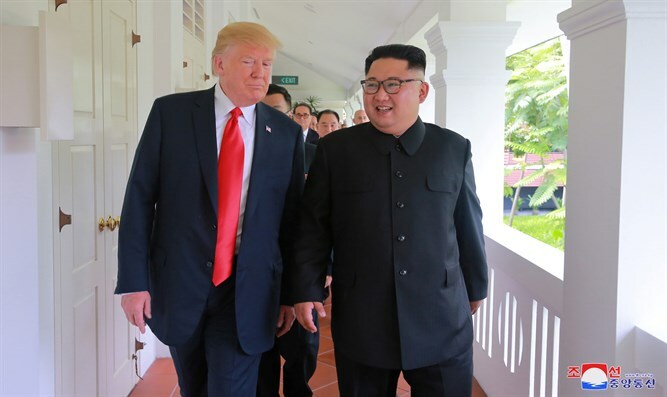 Negotiations between Washington and Pyongyang have stalled since the Trump-Kim summit, with reports suggesting that despite its commitment to denuclearize, North Korea has continued to expand infrastructure at nuclear and missile sites.